The last highway bridge onto Terminal Island is the Vincent Thomas Bridge. It's a 6000 ft long suspension bridge with a 1500 ft long main span and 506 ft long side spans. It carries State Route 47 from San Pedro Island 195 ft above the Cerritos Channel to Terminal Island. It was constructed by John A. Roebling Sons and is eligible for the National Register of Historic Places. As I previously mentioned, the bridge was the creation of the larger than life personality of (William) Jim Jurkovich. However, I don't know if Jim was prouder of this bridge or of playing halfback for the UC Bruins in the 1940s. 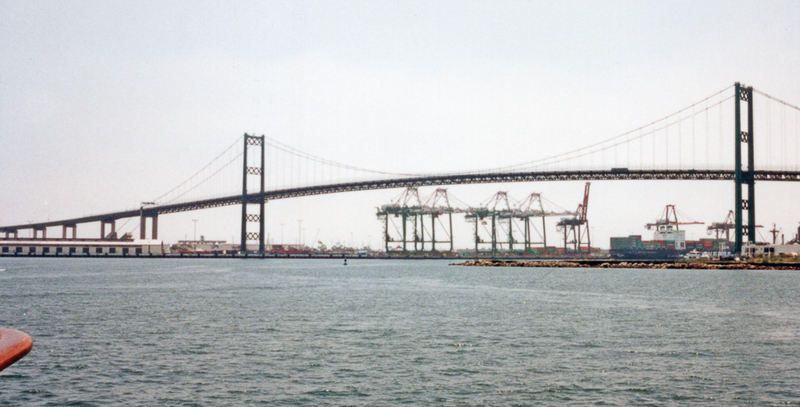 Unlike the other Terminal Island Bridges, the Vincent Thomas Bridge got a seismic retrofit in the 1990s and should be good for another 50 years. Los Angeles County, California Bridges: Vincent Thomas Bridge across the Cerritos Channel by Mark Yashinsky is licensed under a Creative Commons Attribution-NonCommercial-NoDerivatives 4.0 International License.